Columbia Press will be presenting Growing Up With G.I. Joe’s at the Pacific Northwest Booksellers Association (PNBA) trade show in Portland the first weekend in October. I will be there, too, at Table #40. The timing of the book show matches up so beautifully with the November 1st publication date of Growing Up With G.I. Joe’s, when the book will be available at bookstores and online. I can hardly wait for the show! I have enjoyed switching gears from writing, editing, and rewriting my manuscript the past few years to marketing, networking, well, and still writing, to promote my book the past few months. I am also taking extra care on designing the Columbia Press table, including having some wearable give-aways for the bookstore reps that stop by. Throw in some books, graphics, including photos of some of the stores, book info, and I think I’ll be good to go. Oh, and I am having some company promoting the book…Kathy McCuddy Johnson who shared her story of the Columbia River Flood scare of 1956 in Growing Up… will be there, and my son, Sam Nizam, who grew up with G.I. 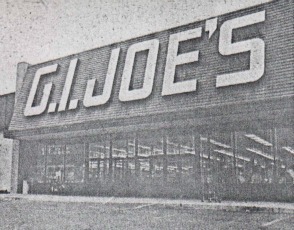 Joe’s in the 1970s and 1980s will be there as well. Should be a fun weekend! If you are in the book biz, please come see us at the PNBA show, Table #40 in the exhibit hall, either Saturday or Sunday. 1 Response to Pacific Northwest Booksellers’ Trade Show in Portland, Here I Come, October 3rd and 4th! Can anyone come or only booksellers? From Janna: The PNBA is a trade show only, so only booksellers can come to this. I am planning some events after November 1st, the official publication date, when the book becomes available.